All of us need somewhere to call home. I’m very lucky in that while I was born and reared both in Dublin and to a lesser extent Dundalk, I’ve always had my family around me. Family to me is everything. I am also lucky that I had both sets of Grandparents to learn from as well as many Uncles and Aunts who I must say, I was extremely privileged to have known. I was born in Killester, a suburb of Dublin in the 1950s. Dublin was a very different place than it is today. Poverty was widespread and a lot of the City was derelict. Tenements prevailed throughout the inner city and a lot of children could be seen playing with skipping ropes and other improvised toys. Hop Scotch was a popular game and if you had a football, well you were a popular kid. No PlayStations, Computer Games or even Mobile Phones were about in those days. You were ‘well off’ if you had a phone in your house ! My mother used to bring me ‘into town’ to do the shopping. While I remember it being tiring I also remember it being a fascinating time. Mum used to make her own clothes. Her father was a Tailor and Cutter and he certainly trained her well. Many a memory I have of calling into the Wollen Mills on the Quays, then across the Metal Bridge to a small shop where she’d buy the buttons, zips and such like. Then on to meet up with her friends and have a ‘chat’. We got the Bus everywhere. Only a few people had a car and I suppose when we got fed up with the Radio, we paid a visit to a friend’s house to watch their Tele. To watch Match of the Day, in Black and White, on a fuzzy screen was marvelous. Top of the Pops, if you could get BBC was amazing. They were tough times but I have nothing but good and fond memories of those days. At the end of the month we used to take the train to Dundalk to see my Dad’s family. My Dad worked in British Railways so we had Privilege Tickets. This meant that we got a Return Ticket for half the price of a Single. I remember getting excited when the train crossed the Boyne after leaving the station at Drogheda and waiting to pass through Dunleer and then Castlebellingham. My Dad would point out the landmarks as we approached Dundalk. We’d take a Taxi from the station to Broughton Street where Grandad used to live. My cousins were great. I was the youngest grandchild and as my cousins were nearly all girls, we’d play house and of course I was always the baby/child. Ah those were the days. While I have great memories I’m also very aware that others weren’t so lucky. Artane Boys School was ‘down the road’ from me in Donnycarney. On the outside the building looked amazing but unfortunately we now know, that all was not so rosy inside. Having met a number of the victims of child abuse who were resident there when I was a little boy growing up, I feel sorry that they were not able to have had the support of a family as I did. When I had children myself, I made a pledge that I would try to be as good to them as my Mum and Dad were to me. I think we’ve done OK as a family despite marriage breakdown some years ago. It wasn’t an easy time but myself and the children got on with our lives. Now, being a Grandad myself I can watch the next generation starting out on their journeys in life. 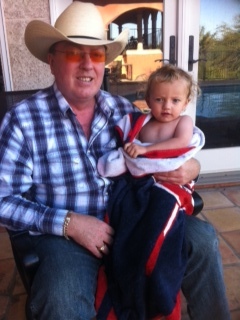 Toes, as regular readers of my ramblings will know, is my grandson. While he’s now approaching the terrible twos and showing appropriate signs 😦 I’ve had the privilege of being part of his life since the day he was born. Lisa and Eddie are good, doting parents and I wish them well. I, for my part have done my fair share of babysitting so far and none more so than in Texas this past summer. They say that travel broadens the mind and if that is so, then Toes has had a great start in life. I got on a plane for the first time when I was eighteen. Toes on the other hand, probably qualifies as a frequent traveller at this stage and he’s not even two ! Life without family would be unbearable for me. That is what life is all about. It’s what keeps me going. While I sit here in Texas with Toes and walk about the land, trying to keep up with him, us both dressed like we’re locals wearing our Cowboy Hats, I do realise what a privilege it is to be part of a loving family. We are very lucky and it is sad that all children don’t get the opportunities that both myself and now Toes enjoy. LegalEagleStar , San Antonio, Texas, Tuesday, 27th. September , 2011.